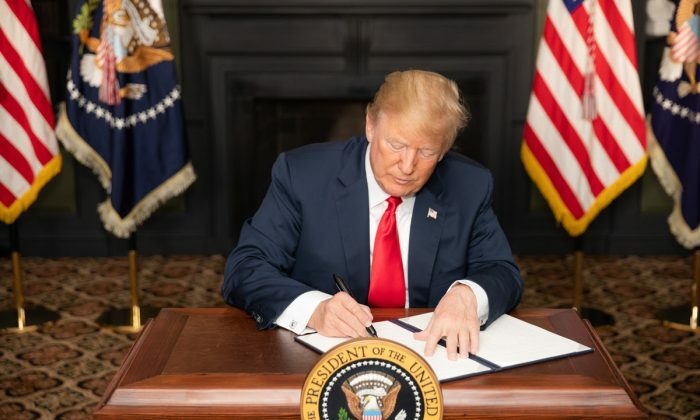 The United States will reimpose a broad set of sanctions on the Iranian regime on Aug. 7, executing a plan set in motion by President Donald Trump when he withdrew from the Iran nuclear deal three months ago, according to senior U.S. administration officials. The sanctions will take effect as widespread protests grip Iran with citizens calling for regime change. 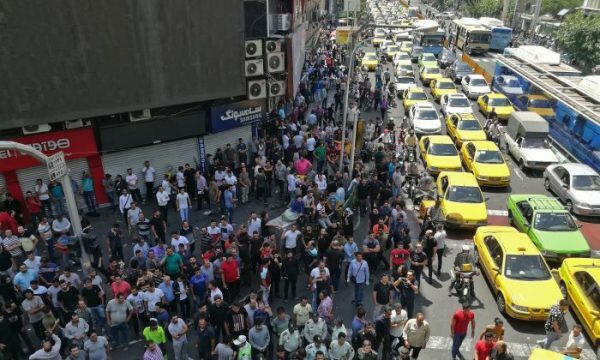 The protesters are angry about corruption within the regime and the use of the country’s wealth to fund malign activities in the region instead of helping the Iranian people. Senior U.S. administration officials told reporters on Aug. 6 that the United States supports the Iranian people but is not calling for regime change. The officials accuse Iran’s rulers of being the biggest funders of terrorism in the world, supporting dictators, and playing a destabilizing role in the Middle East. The sanctions are part of an effort to change the regime’s behavior, the officials said. Trump deferred the reimposition of two sets of sanctions against Iran by 90 and 180 days when he withdrew from the nuclear deal in May. Iran started to suffer from the sanctions even before the measures came into effect. The nation’s currency is collapsing, more than 100 international companies announced their intent to leave the country, and unemployment is rising. “I am pleased that many international firms have already announced their intent to leave the Iranian market, and several countries have indicated that they will reduce or end imports of Iranian crude oil,” Trump said in a statement on Aug. 6. A senior U.S. administration official told reporters that at 12:01 a.m. on Aug. 7 Washington will start enforcing sanctions impacting several trade categories, including the purchase of U.S. dollars, the sale of precious metals, transactions involving Iranian currency, the issuance of Iranian debt, and the Iranian regime’s automotive sector. The details of the sanctions are set out in an executive order Trump signed on Aug. 5 in Bedminster, New Jersey. The August sanctions will be followed by a second set of measures in November, which will impact Iran’s oil and energy sectors, financial institutions, port operations, shipping and shipbuilding, and the insurance industry. On July 30, Trump offered to meet Iranian President Hassan Rouhani without preconditions. Iran responded to the offer by demanding that the United States rejoin the Iran nuclear deal as a condition for meeting. A senior U.S. administration official said that the sanctions will remain in place until Iran stops enriching uranium and ceases its malign activity in the Middle East. “We are intent on cutting off the regime’s access to resources that they have systematically used to finance terror, fund weapons proliferation, and threaten peace and stability in the region,” the official said. China, Russia, Germany, France, Britain, and the European Union are still party to the Iran nuclear deal. While on the campaign trail and after taking office, Trump has panned the Iran deal—officially titled the Joint Comprehensive Plan of Action (JCPOA)—as a disaster. The president doubled down on criticism in his statement on sanctions on Aug. 6. “The JCPOA, a horrible, one-sided deal, failed to achieve the fundamental objective of blocking all paths to an Iranian nuclear bomb, and it threw a lifeline of cash to a murderous dictatorship that has continued to spread bloodshed, violence, and chaos,” Trump said. Iran’s Revolutionary Guards confirmed on Aug. 5 it had held war games in the Gulf over the past several days, saying they were aimed at “confronting possible threats” by enemies, state news agency IRNA reported. U.S. officials said on Aug. 2 that the United States believed Iran had started carrying out naval exercises in the Gulf, apparently moving up the timing of annual drills amid heightened tensions with Washington. The U.S. military’s Central Command confirmed on Aug. 1 it has seen increased Iranian naval activity. The activity extended to the Strait of Hormuz, a strategic waterway for global oil shipments the Revolutionary Guards has threatened to block. U.S. officials said the drills appeared designed to send a message to Washington. Iran did not appear interested in drawing attention to the drills. Iranian authorities had not commented on them earlier and several officials had declined to comment.